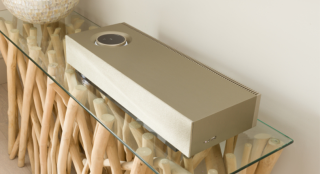 Naim Audio Mu-so now available in champagne finish | What Hi-Fi? For £995 you'll be able to order the extra-swish Mu-so from John Lewis next week. Other retailers get their hands on it in October. The Naim Mu-so is a superb wireless speaker, so much so it's been topping our charts ever since it came out in 2014. So if you haven't yet got one pumping out your tracks, and want something a little special, then consider Naim's recently announced Special Edition Champagne Finish version. There's little the Mu-so can't turn its hand to. AptX Bluetooth (for 'CD-like' quality), Apple AirPlay 2, Spotify Connect and Tidal are all compatible with this speaker. When it comes to your own library of music, the Mu-so is au fait with 24bit/192kHz WAV, FLAC and AIFF files. This limited-edition model is exclusive to John Lewis in-store and online from the 23rd of August, priced £995. It is available via other retailers from 4th October.